SecureVizual’s concise, easy-to-read dashboards provide you with the information you need to optimize your security workforce and run your team efficiently. Effectively account for every person through your doors using SecureVizual’s real-time credential system with trackable, verified facial recognition. SecureVizual’s KPI-driven visual dashboard helps you track and optimize physical security procedures and allocation so your team can make more efficient decisions. How Do SecureVizual Dashboards Work? 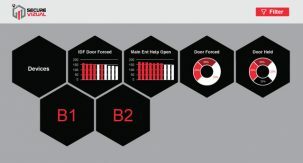 SecureVizual dashboards are a metric-based reporting tool that provides you with a visualization of the effectiveness of your security system and procedures. They can collect data from any SQL database and clearly present it for any event or activity you need to track. Do You Feel Buried in Data? Does your gut tell you something, but you need to hard data to back up your plan to shift manpower around? Our dashboards will lay out the data in an efficient, visual system to effectively manage people, develop policies and procedures, adjust staff assignments, and modify system configurations. Whether you need perimeter recognition at every access point of your corporate campus or a better way of tracking BOLOs on your school grounds, SecureVizual’s identity recognition protection system, Identity in Motion, will be there. Go beyond a photo tacked to the wall by the security desk. Identity in Motion offers high-quality, real-time identification so you can immediately alert your team to intervene and better manage risk. Staffers, contractors, and visitors will all be enrolled in Identity in Motion once they come onto your property. This means that an associate simply politely holding the door open for a stranger won’t put your building in jeopardy. Track who comes and goes, identify the risks. Interested in learning more about our services? We’d love to demonstrate what SecureVizual can do for you!